INDIANAPOLIS — People living in a northeast neighborhood are being forced to connect to the city's sewer system. A system that will cost them thousands of dollars. On Vera Drive, right off of Allisonville road, nearly two dozen homeowners are being forced to pay as much as $20,000 to connect the city sewer. Money that most of them do not have. Robert Knotts, one homeowner, was laid off last September. "I received a severance package, and everything, but I've been working 40 hours at a part-time job just to make ends meet. And this would kill us," he said. It would cost between $15,000 to $20,000 just to hire a contractor to install the low-pressure system. The Marion County Health Department said that these homeowners have to connect to the city sewer line installed on their street. "Most of us want to be connected," Knotts said. "It's the price, it's killing us." 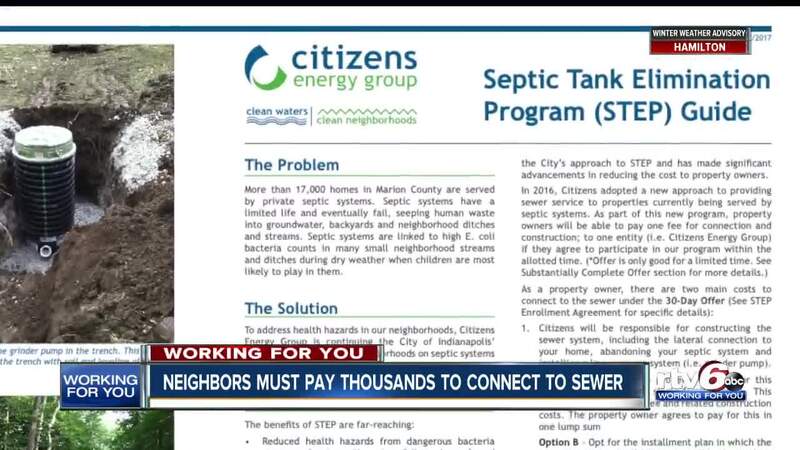 Citizen's Energy Group said they're disqualified from the county's Cost-Saving Septic Tank Elimination Program (STEP), because someone down the street hired a private contractor in 2017 to install a sewer line. The Indiana Health Department said resident can apply for a five year extension, but these homeowners say that is not enough. This neighborhood said they feel as though they have been misled since they were first notified two years ago. Citizens Energy said that they do not identify their neighborhood as a high-priority area for STEP. But for these neighbors, it's a matter of survival. This neighborhood group has a meeting planned for next month to decide on their next steps. Later this week, they'll be meeting with Republican Senator, John Ruckelshaus, to ask for help.